The Christmas lights have all been turned on by well known (and some lesser well known) celebrities. Now it's the turn of the big store windows to vie for our attention. They shout out "come on in, you know we have everything that you could possible want or need to buy as a Christmas gift for anyone". In a small twist on a famous line from the Bladerunner movie ... "time to buy"
You just hit on one of my favorite things about Christmas: the window displays!!!! In NYC they're AMAZING, especially at places like Macy's. Thanks for sharing... I love all Christmas displays! We don't get much in window displays here in Phoenix. The vast majority of stores are all located in malls so the window displays aren't as elaborate as they are in places like New York. But, the insides of the stores have been decked out in the Christmas mood since the end of October. 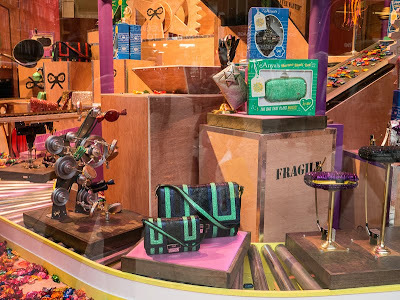 I am wondering what Selfridges windows are like this year, also Fortnums. They are usually my favourites.